A Black Lives Matter activist identified as Ashley Williams holds a sign referencing a statement Hillary Clinton made during a 1996 speech. A Black Lives Matter activist confronted Democratic presidential candidate Hillary Clinton during a fundraiser in Charleston, S.C., on Wednesday. 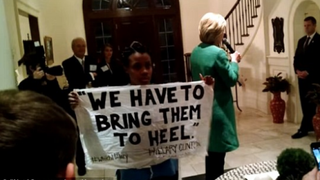 The protester, identified as Ashley Williams by the Huffington Post, paid $500 to attend the function while holding a sign that read, "We have to bring them to heel," a reference to a speech Clinton made in 1996 in which she claimed that kids in gangs were "superpredators." During the January 1996 speech, which took place in Keene, N.H., Clinton, while discussing the 1994 Violent Crime Control and Law Enforcement Act, noted that the government needed an "organized effort against gangs, just as in a previous generation we had an organized effort against the mob. We need to take these people on. They are often connected to big drug cartels. They are not just gangs of kids anymore," she said. "They are often the kinds of kids that are called superpredators." She continued: "No conscience, no empathy. We can talk about why they ended up that way, but first we have to bring them to heel, and the president has asked the FBI to launch a very concerted effort against gangs everywhere." "I'm not a superpredator, Hillary Clinton," Williams says to her in a video of the incident that was posted on YouTube. "OK, fine, we'll talk about it," a visibly annoyed Clinton says. "Can you apologize to black people for mass incarceration?" Williams asks. "Can I talk, and then maybe you can listen to what I say?" Clinton then asks. Clinton tries to tell the 100 or so donors gathered at the event about the speech she gave in 1996 when Williams shouts, "You called black people superpredators." "You want to hear the facts or do you just want to talk?" Clinton asks. The back-and-forth between the protester and the Democratic presidential hopeful continues until Williams is escorted out of the event. "Umm, OK, back to the issues that I think are important," Clinton says while donors applaud.